Tag Archives: student travel washington d.c. 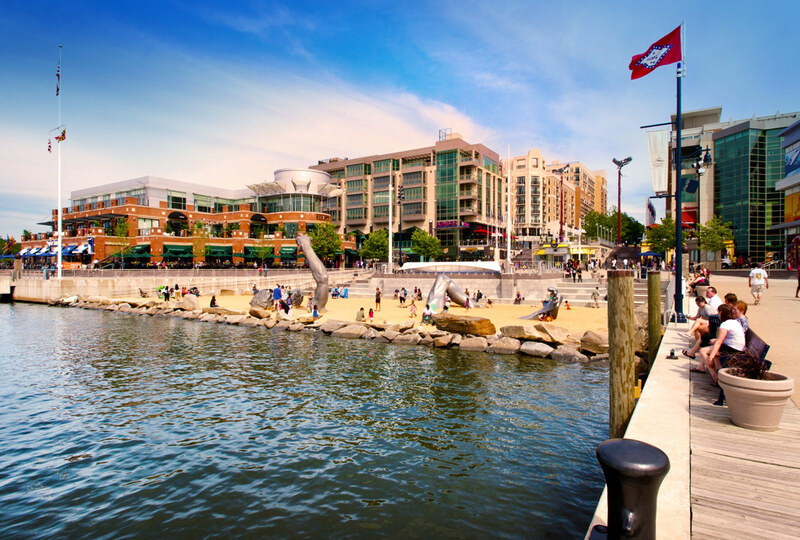 The National Harbor is a shopping, dining and entertainment area on the shores of the Potomac River in MD, overlooking the D.C. skyline. Washington, D.C. is the center of American political and social life and has been a hub for international visitors since the beginning. For foreign students traveling to Washington D.C. for the first time, it is almost always a thrilling experience. However, seeing everything that the area has to offer can take weeks. So the question for trip leaders may be – where is a student tour group to start? And which are the most important points of interest? Many students from other countries want to shop in the U.S. They can obtain goods that may not be available in their country. Trip leaders need to know that there are several points of interest in the Washington D.C. area where the visitor can combine sightseeing, shopping and dining. National Harbor: A Grand View of Washington D.C.
With its many shops and restaurants, The National Harbor is situated on the Maryland side of the Potomac River. It is a great place to kick off any excursion. Students can board The Capitol Wheel, a towering 180-foot wheel with enclosed cars, that offers sweeping views of the Washington Monument, the U.S. Capitol building, and the whole glittering panorama of the city itself. Groups can also cruise the Potomac (or even sail right to the National Mall & Memorial Parks) on the Alexandria-National Harbor Water Taxi, which operates day and night. When it’s time to shop, choose from 150 retailers, with an outlet mall that appeals to everyone. There are also 30 different restaurants to choose from at the National Harbor, ranging from McDonald’s to a high end dining experience overlooking the Potomac. Downtown Washington D.C. also has more than its share of fun theme restaurants: the Madhatter, which has been a city institution for more than 30 years, takes its name, its décor, and its inspiration from Alice in Wonderland. Or, have the student group sample some Astro Doughnuts & Fried Chicken. Here, patrons can sample maple-bacon, s’more, or passionfruit pastries. Astro Doughnuts is the kind of fun and quirky eatery that students are bound to love. There’s also never any shortage of shopping, historical sights, and dining in D.C.’s legendary Georgetown neighborhood. Students can take the Gastronomic Georgetown Food Tour, an outing that will expose them to gourmet French and Italian cuisine, delectable desserts from D.C.’s best bakeries, and other capitol-region culinary delights. One-stop shopping (as in something-for-everyone) is also an apt way to describe D.C.’s Smithsonian Museums. Students can take in three centuries of American art at once, or explore “the final frontier” (as Star Trek calls it) at the National Air and Space Museum. At these prominent museums, the foreign visitor will find lots of interesting merchandise for purchase, from clothing to jewelry to interesting limited edition art and memorabilia. Students may also want to visit the magnificent Anderson House, a lavish 50-room mansion-museum located in the city’s historic Dupont Circle neighborhood. This is always a feast for the eyes, and a rare glimpse into what it’s like to live like American royalty. When it comes to dining out, it doesn’t get any hipper than the Hard Rock Cafe, located near Washington D.C.’s bustling Chinatown district. Students can also visit the cafe’s “Rock ‘n Roll Embassy,” which is situated right next to the world-famous Ford’s Theater. Washington D.C. is also known for its lively dinner theater scene: at Medieval Madness at Renaissance Hall, students can enjoy a 4-course “knights of the round table” type feast while they take in a medieval-themed play, complete with sword fighting. Finally, if foreign students are looking for really offbeat entertainment, they’ll find it at the Spy Museum, where they’ll learn how to decrypt secret audio conversations, escape from inescapable places, and engage in their own missions of espionage and intrigue. It is definitely an educational experience—and a great time that gives the term “interactive exhibit” a whole new meaning. To sum it up, there’s no shortage of entertainment in the nation’s capitol, and for foreign students looking to get a taste of sightseeing, dining and entertainment all in one – there’s no place quite like Washington, D.C.
For more information about booking a tour your foreign students will never forget, email: info@educationaltravelconsultants.com, or visit the website at http://www.educationaltravelconsultants.com. educational travel companieseducational travel companystudent travel companiesstudent travel companystudent travel washington d.c. Recently, teacher Brynley Martin, who has taught eighth grade English Literature and history at Oak Hill Jr. High School for twelve years, took her students on a tour of Washington, DC. It’s a trip her classes make every year, and one that new students look forward to and former ones always remember fondly. When students travel to Washington D.C., they get to immerse themselves in their fields of study in ways that go far beyond requisite classroom discussion and research. This particular student tour covers a wide range, from cornerstones like the National Archives (in which the Constitution, the Bill of Rights, and the Declaration of Independence are housed) to the many exhibits in the Smithsonian, like the American History and Air and Space Museums. This student travel group also visited Mount Vernon, the plantation of George Washington and landmark of the Revolutionary War. It was important to Martin that the students also take a close look at the Holocaust Museum—an experience many students have described as profound and life-changing. I recently interviewed Brynley Martin about her most recent class trip from Converse, Indiana to Washington D.C.
Q: What is your official title at Oak Hill Jr. High School? A: I am an eighth grade English and Literature teacher. Q: How often do you take your students on tour in Washington D.C.? A: This will be my seventh year. The tours have been great, and every one of them is different. Every student group is composed of students who are seeing and assimilating these sites for the first time. Q: Have you toured other cities in the US? A: No, just Washington D.C. so far. Q: Washington is a city that’s critical for an understanding of U.S. History. How does the tour of DC tie into the class you teach? What specific parts of American history are covered? A: We dedicate nine weeks in literature class to the study of the Holocaust. We visit The Holocaust Museum to supplement our studies and to understand the real stories of people who suffered and died in it. This puts a greater emphasis on what we’ve learned. We also study the origins of the U.S., from the Revolutionary up to the Civil War. Q: The Newseum is a museum dedicated to news and media in American culture. This ties directly into written and spoken language in English, and the ways it’s used to communicate information. Can you comment on student’s reactions to visiting it? A: On previous trips, we hadn’t had time to really check things out. But the students loved it. There’s so much stuff to see there, something for everyone. Q: Your class visited the National Archives. What specifically did you want your students to see there? A: Specifically, the Declaration of Independence, which is sometimes not the easiest thing to see because the lines are so long. It was great for them to be able to see it in detail during this last trip. Q: How was your trip to the Holocaust Museum? A: We always request the full tour there. It is very important to our trip, and the kids are moved by it. They get to learn about the Holocaust through more than just books, which always affects them in profound and significant ways. Q: Describe any post-trip writing or speaking students were required to perform to assimilate their experiences. A: All students bring a disposable camera on the trip. They use their photos to create a comprehensive and individual project about their own experience. They present this project to the rest of the class, through the lens of their own point of view. Q: How long have you been doing these tours? What has been your experience with the tour guides and other staff? A: I think we’ve been traveling for six years now. The tour guides have been awesome! They are very knowledgeable about Washington D.C. and have always worked well with us to solve any problems that might come up. It’s been a great experience, overall. Every student will take something personal away with them from the trip, while also gaining a greater understanding of history and the way language is used to make and change it. Exposing students to places like the Holocaust Museum is instrumental in promoting an understanding of the ethical responsibilities of history. Up close and personal exposure to exhibits housed in the National Archives and the Smithsonian can provide a fresh and vital perspective for learning. All these make for a uniquely visceral experience that serve to broaden and enhance classroom studies in essential and innovative ways. Martin feels that these trips to Washington D.C. positively impact her students, and broaden their appreciation and knowledge of their studies, so she will continue to take groups on tour. Many students of American history read about the War of 1812 as part of their studies of Nineteenth Century history. This naval war impacted the burgeoning United States and the port cities along the East Coast, as well as cities inland, along major waterways. This year, Baltimore, Maryland is the focus of the national launch of the Bicentennial of the War of 1812 with the Star-Spangled Sailabration from June 13-19, 2012. This kickoff celebration begins in Baltimore Harbor where visitors can see a spectacular display of U.S., British and Canadian naval vessels and tall ships from around the world. Audiences will also see an air show featuring the Blue Angels. Teachers and trip leaders are encouraged to combine a visit to Washington D.C. with a visit to Baltimore to experience the Bicentennial of the War of 1812. Even if the student group is not available to travel from June 13-19, they may still experience part of the Bicentennial celebration. Baltimore and other cities throughout the U.S and Canada affected by the War of 1812 will continue to stage events dedicated to the remembrance of the War of 1812 through 2014. Following is a brief outline of the six major sites in Baltimore and Washington D.C. that reinforce studies of the War of 1812. In addition to Baltimore, Maryland, and Washington D.C. other states participating in this event are: Alabama, Indiana, Kentucky, Louisiana, Massachusetts, Michigan, New York, Ohio and Pennsylvania. Student travel groups destined for any of these locations can also tie their trip into War of 1812 sites in these locations. Many Americans and representatives felt an attack on Baltimore was imminent after a declaration of war against the British. So, Fort McHenry was prepared with fortifications and soldiers to defend the city against the British. This site is well-preserved and maintained by the National Park Service. Fort McHenry is known as the star fort, because it was constructed in the shape of a five-pointed star. The fort was attacked by British cannon fire and survived the battle. Students will want to tour the house where Mary Pickersgill sewed the flag that flew over Fort McHenry during the battle of 1814, when the Fort was under assault by the British. Pickersgill lived here with her daughter Caroline and her mother, Rebecca Young, who started the flag-making business during the Revolutionary War period in Philadelphia. Student groups can tour the home that is decorated with 19th century furniture and fixtures. Frequent living history presentations are also staged here, so students may encounter Mary Pickersgill, Rebecca Young or Grace Wisher, the African-American apprentice who lived and worked there. These living history actresses will narrate their story in the first person to help make the process of creating the flag come alive. Students can see a special exhibition for the Bicentennial of the War of 1812 here: “Farmers, Patriots and Traitors: Southern Maryland and the War of 1812.” At the time of the War of 1812, the U.S. had no organized naval fleet. So, in June of 1814, Commodore Joshua Barney pulled together a fleet of eighteen gun boats, barges and sloops to take on the British Navy. This unofficial fleet of ships engaged in battle with the British Navy twice in June of 1814. The battles took place at the intersection of the Patuxent River and St. Leonard Creek, near the shores of Jefferson Patterson Park and Museum. They are known as the largest naval engagement in the history of Maryland, and helped turned the tides of the War of 1812 in favor of the U.S.
Students can see the actual flag that inspired Francis Scott Key to write the National Anthem in the The Star- Spangled Banner exhibition at the National Museum of American History. The flag is 200 years old and measures 30 x 34 feet. It is housed in an environmentally controlled chamber to preserve it and visitors can interact with the artifact through a tactile image. Student groups may visit the White House as part of their scheduled tour. James Madison was President of the United States when he asked Congress to declare war on June 1, 1812. Teachers can prepare classes for this study by taking an in-depth look at Madison’s presidency, and his reasons for going to war, prior to the trip. In addition to these War of 1812 sites, student groups can learn more about other historical periods by visiting the Baltimore and/or Washington D.C. area. Popular destinations include the U.S. Capitol Building, the monuments tour, Mount Vernon and more. Check the events schedule on The Official war of 1812 Bicentennial Website to see if a student trip schedule will coincide with other public events. To request a quote for a class trip to Baltimore and Washington D.C. visit http://www.educationaltravelconsultants.com.